Capping over 50 years of touring and recording, George Clinton is set to embark on his final tour with the legendary Parliament Funkadelic before he retires. After joining Red Hot Chili Peppers for a 9 city tour of Australia Feb-March, George and P-Funk follow up with their own Australian headline tour in April where they will hit the legendary Bluesfest stage in Byron Bay, and a stint in Japan at Billboard Live. 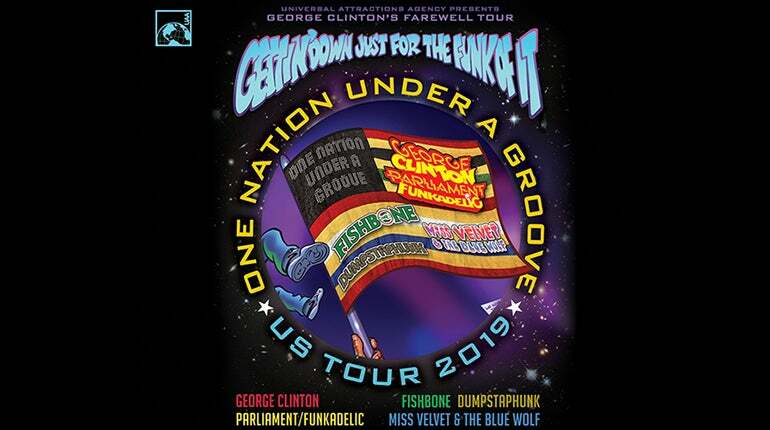 Starting after Memorial Day weekend the group will hit the road in North America with the “One Nation Under a Groove Tour”. Joining P-Funk to send this icon of American pop culture off with a BANG are Dumpstaphunk, and Fishbone, and Miss Velvet & The Blue Wolf all of whom are taking time out of their own busy schedules to hit the road with the Grammy-winning, once-rainbow-dreaded pioneer of Funk, Hip Hop, and Rock & Roll.